Every 3 minutes, an allergic reaction to food sends someone to the emergency room – that means food allergies result in an estimated 200,000 ER visits a year. According to a study released by the CDC in 2013, food allergies are becoming increasingly common: in fact, food allergies among children in the U.S. increased by approximately 50% between 1997 and 2011. Nobody knows why the number of people with food allergies is on the rise, but it’s clear that this widespread and potentially life-threatening illness is an important safety and liability consideration for restaurateurs. 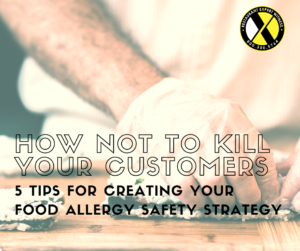 To protect consumers with food allergies, restaurant owners must create and instate comprehensive food handling policies and educational programs that inform employees and customers alike of the precautions that should be taken to reduce the risk of an allergy emergency. The five suggestions listed below will get you started creating your own safety strategy! The best defense is a good offense: Your standard operating procedures for preparing and serving food for guests with food allergies should be in writing! Allergy-conscious food handling procedures include precautions against cross-contamination (the unintentional incorporation of an allergen through contact during food preparation or storage) as well as instructions on how to guide guests in making safe selections from the menu. It is also important to establish a procedure that details what employees should do in case an allergy emergency happens. Knowledge is power: Management should provide ongoing food handling training and education to all employees, including those who aren’t directly involved in the preparation of food. For example, a host or hostess should know to inform the designated staff member or manager immediately if a customer tells her or him they have a food allergy. Servers should be aware of the danger of cross contamination when serving or handling food. Create a checklist of topics to be discussed before employees begin serving food or interacting with customers, and be sure to document when and to whom you provide training. What’s Inside Counts: Employees should be familiar with all ingredients that are put in food items, because allergens are often found in common food products. Worcestershire sauce contains fish, BBQ sauce may contain nuts, imitation butter commonly contains milk protein, canned tuna may contain milk or soy protein, etc. 5. Post emergency contact information: Post emergency contact numbers and the name and address of your restaurant next to every telephone so that this information can be quickly provided to first responders. Want to know more about the requirements and regulations that govern food allergy precautions in restaurants? Interested in more detailed information about developing your own food allergy safety policy? Check out Howard’s newest book, Restaurant OSHA Safety and Security. You can purchase a copy click HERE or EMAIL us!